WASHINGTON (Reuters) - U.S. lawmakers on Wednesday blasted Mylan NV Chief Executive Heather Bresch for sharply increasing prices for the EpiPen emergency allergy treatment at a congressional hearing in which Republicans and Democrats questioned the reasons behind rising U.S. drug costs. The House Committee on Oversight and Government Reform called Bresch to testify in the wake of public outrage over EpiPen, whose list price has risen to $600 for a pair of the devices compared with $100 in 2007. Lawmakers in turn described the actions as "sickening," "disgusting" and showing "blatant disrespect" for American families who can no longer afford the life-saving device for children susceptible to severe allergic reactions. At several points, they cut off Bresch's efforts to explain the intricacies of U.S. pharmaceutical pricing, including how health insurers and other payers take a percentage of treatment sales. Several lawmakers noted EpiPen's growing profits over the same period as well as Bresch's annual salary, which has increased from around $2.5 million to more than $18 million. They also faulted the U.S. Food and Drug Administration for moving too slowly to allow competing products to reach the market. U.S. Representative Elijah Cummings, ranking Democrat on the committee, said Mylan "jacked up" the price of the product "to get filthy rich at the expense of our constituents." He questioned whether Mylan would change course in any way following the backlash over its pricing. "After Mylan takes our punches they'll fly back to their mansions in their private jets and laugh all the way to the bank," Cummings said. Bresch defended the price hikes, saying that after rebates, marketing costs and other expenses, Mylan earns about $100 for a pair of EpiPens. 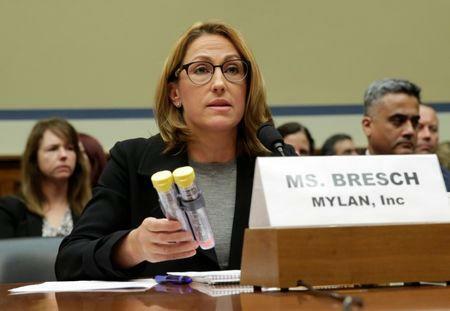 She emphasized that the company plans a half-price version of the device, that it provides them free to many schools and said that Mylan's generic medications combined have saved the U.S. healthcare system $180 billion in costs over a decade. "Our concern was absolutely that anyone who needs an EpiPen has one," Bresch told the hearing. Mylan will also soon seek approval for a new formulation that extends the shelf life of EpiPen from 18 months to at least 24 months, cutting down replacement costs, Bresch said. The EpiPen is an automatic injector, delivering a dose of the generic medicine epinephrine through a quick jab in the thigh. It commands over 90 percent of the market, with no competition expected until next year at the earliest. "I am a very conservative, pro-business Republican, but I am really sickened by what I ... heard here today," Representative John J. Duncan Jr. of Tennessee said at Wednesday's hearing. The EpiPen price increases ignited a national controversy in August following complaints by families. Congressional lawmakers have called on federal agencies to investigate Mylan’s business practices. At the hearing, Committee Chairman Jason Chaffetz of Utah questioned why Mylan could now afford to offer a generic version of EpiPen for about $300. "Suddenly, feeling the heat, Mylan has offered a generic version and cut the price in half, so that does beg the question what was happening with that other $300?" Holding up an EpiPen, he said: "the actual juice that's in here that you need costs about a dollar." In 2015, EpiPen accounted for $1 billion of Mylan's overall sales of $9.45 billion and about 20 percent of company profit. Critics say EpiPen would remain profitable at a lower price. A recent analysis by the consumer watchdog Public Citizen found that an EpiPen two-pack costs $69 in the United Kingdom, $181.81 in Canada and $210.21 in Germany. Lawmakers are trying to determine whether Mylan made more money on EpiPen than warranted from state Medicaid programs by having it classified as a generic product, resulting in much smaller rebates to the government health plans. The FDA classifies EpiPen as branded but the Centers for Medicare and Medicaid Services deems it a generic for the purposes of Medicaid's drug rebate program. Participating companies pay 13 percent in rebates on generic drugs versus 23 percent on branded products. Mylan has said it complied with all laws and regulations regarding rebates. EpiPen has also increased the cost burden to the Medicare program for the elderly, according to an analysis from the Kaiser Family Foundation, a health policy research group. Before rebates, EpiPen costs for Medicare Part D increased more than 1,000 percent between 2007 and 2014, from $7 million to $87.9 million, the report said.